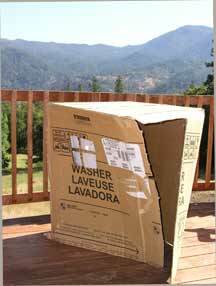 One of my fondest childhood memories was playing with a brand new refrigerator box with our neighbors in the front yard. This large box was a space ship, a school bus, a house, etc. Parents know that kids love boxes, and sometimes these corrugated containers are more interesting than the toys they contain on birthdays and holidays. Kidsonroof has combined children’s love of cardboard boxes with dramatic play to create the MobileHome. The MobileHome is made from recycled cardboard, is biodegradable, five percent of profits are donated to UNICEF, and is made in China. It has eight secret rooms and is easy to take with you to the park, on vacation, or around the house. My children immediately integrated their other toys, including their children’s yoga mat, into dramatic play with our MobileHome. 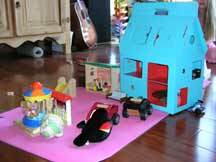 Large wooden dollhouses can be very expensive, yet both boys and girls love to play with with little houses. The MobileHome offers a semi-affordable solution; however, $32 seems like a little much for cardboard box. I do like the MobileHome, but I also think that children learn a lot by creating their own cardboard box homes. Recently my daughter created one from our new washing machine box, complete with curtains. Whether you provide your child with a MobileHome or simply a cardboard box, their creativity will flourish as they decorate and play! I found a great collection of eco friendly toys from By Nature. They are recycled cardboard cut out forts shaped like a castle, rocket ship, or dollhouse!